I present here a defence of the following proposition: to maintain consumption per person in the long run as non-renewable resources are increasingly depleted, the world needs technical progress so that we can obtain more output from available resources. The alternative suggested by the Hartwick rule, relying solely on investment in man-made capital to substitute for natural resources, is extremely unlikely to work. That the world needs technical progress to maintain per capita consumption as non-renewable natural resources are depleted may seem non-contentious. Admittedly, it’s questionable whether sufficient technical progress is possible, and arguable that those of us who are well-off should to some degree adapt to resource scarcity by consuming less. But if one accepts that some essential resources are non-renewable, and accepts the objective of maintaining consumption, then surely it’s undeniable that the development and use of improved technologies is the only approach that offers any chance of success? There is, however, a line of thought which suggests that consumption could be maintained without technical progress. It has three building blocks. The first starts from the fact that man-made capital can to some extent substitute for non-renewable resources (recycling plants, for example, can facilitate re-use of metals, reducing demand for mining of metal ores, and better-insulated homes can reduce demand for fossil fuels for heating). But it asserts much more: that although the use of non-renewable resources can never be eliminated altogether, there is no minimum quantity of non-renewable resource needed to produce a given level of output. However little non-renewable resource is being used at any time, it would always be possible to use even less, by substituting for it even more man-made capital. The second building block is that depletion of non-renewable resources could take place in such a way that the rate of extraction and use progressively declines but never reaches zero. At any future time, therefore, there will remain some small quantity of non-renewable resource which, together with sufficiently large and increasing quantities of man-made capital, may support sufficient output to maintain consumption into the even more distant future. The third building block is that the composition of output – how much is for consumption, and how much for investment in man-made capital – could include sufficient investment at all times that man-made capital would increase rapidly enough to offset the declining use of non-renewable resources. How all this might be brought about –whether it would be best achieved via market forces or central planning – is beyond the scope of this post. Taken together, these building blocks offer a plausible scenario in which long-run constant consumption without technical progress might be possible. But whether it really is possible, at what level, and under what conditions, are further questions which I address below. My argument is not a proof or demonstration – it could be challenged in various ways -, but I offer it as a fair-minded assessment based on relevant theory and available data. Since the marginal product of capital will be positive, the rule implies that the marginal product of the resource should rise and therefore the rate of use of the resource should fall. These rules have often been expressed rather differently from the above, using the concept of economic rent (2). The assumption, often implicit, is a competitive economy in which returns to factors equal their marginal products. For our purposes it is simpler to avoid that assumption and state the rules directly in terms of marginal products, as above. From the literature may be extracted the propositions below. Unless otherwise stated, constant consumption means a stream of consumption at a constant rate extending into the future with no time limit. Proposition 1: Constant consumption is only possible if (Solow 1974 (3)). Proposition 2: If the Hotelling and Hartwick rules are both satisfied, then output and consumption will both be constant, with (Hartwick 1977 (4)). Proposition 3: Any two of the following imply the third: a) satisfaction of the Hotelling rule; b) satisfaction of the Hartwick rule; and c) constant consumption (Buchholz, Dasgupta & Mitra 2005 (5)). Note however that constant consumption can occur with neither of the rules being satisfied. This can be shown by starting from a scenario satisfying both rules, and then considering the effect of reducing consumption to a lower constant level. Then, compared to the original scenario, will grow faster (while the time path of will be unchanged), implying that will grow. Hence will grow faster while will be less, so the Hotelling rule will not be met. Hence the Hartwick rule also will not be met (otherwise Proposition 3 would imply a contradiction). ; (consistent with a constant-returns Cobb-Douglas production function when labour is explicitly included with parameter 0.6), based on Solow (1974)(7) and allowing for a subsequent fall in the labour parameter based on income shares to c 0.6 (ILO / OECD (2015)(8)). Current world GDP per capita = $10,000 (all monetary values are in current US$) (World Bank (9)). Current world Consumption per capita = $7,500, based on GDP per capita as above and gross savings ratio 25% (World Bank (10)). Current world Capital per capita = US$ 20,000, based on GDP per capita as above together with an average capital-output ratio of 2, inferred from charts in Johansson et al (2013) (11). Current world oil reserves per capita = 300 barrels, based on total reserves for 17 largest countries 1,324 x 109 (12) rounded up to 2,000 x 109 for smaller countries, divided by world population 7 x 109. Annual world oil extraction / use per capita = 5 barrels, based on total demand 35 x 109 barrels (IEA (13)) divided by world population 7 x 109. The choice of oil as representative is based both on its importance and on the estimated life expectancy of its reserves being towards the middle of the range of life expectancies of different minerals (Tilton 2006 (14)). The choice of reserves rather than the much larger resource base (15) as the appropriate measure of stock in this context is because exploitation going beyond reserves is likely to require either technical progress or, if relying on current technology, high extraction costs which would make constant consumption much harder to achieve. This may seem quite promising. It suggests that it might be possible, without technical progress, to sustain indefinitely a level of per capita consumption well above the current average level of $7,500. However, the above argument ignores depreciation of man-made capital. In some contexts that might be a reasonable simplification. Here, however, it is particularly inappropriate. This is partly because we are concerned with the long term, in which the cumulative effect on the capital stock of even a moderate rate of depreciation becomes very large. It is also because, in a scenario which relies on ever-increasing man-made capital to substitute for depletion of the natural resource, the cost of replacement capital to offset depreciation becomes ever larger. That creates a potential problem: can output continue, indefinitely, to be sufficient to provide for replacement capital, as well as consumption and additions to capital? Proposition 5: If capital depreciates at a constant positive proportional rate, then constant consumption is impossible (Buchholz, Dasgupta & Mitra (2005)(15)). Given this proposition, our focus naturally switches to this question: if constant consumption forever is impossible, then for how long is it possible? If it were found that constant consumption could continue for, say, 500 years, then all but fanatical advocates of zero discount rates would probably accept that that would be almost as good as forever. However, the maximum duration of constant consumption will depend upon the rate of consumption and the rate of depreciation of capital . For the latter, I used 8%, based on 16.5% of GDP (OECD (16)) divided by capital-output ratio 2 and rounded. A spreadsheet was set up applying the production function, the state equations for capital (adjusted to allow for depreciation) and the resource, the above rule, and a fixed rate of consumption. To ensure that the discrete approach implicit in use of a spreadsheet was not a source of material inaccuracy, each row represented a period of just 0.01 years. When a trial value was entered for use of resource in the first period, values of all the variables were automatically calculated for all subsequent periods. These values were inspected to identify 1) the period at which the resource became exhausted, and 2) the period (if any) at which the rate of output fell below that of consumption. The trial value was repeatedly adjusted until a value was found at which periods 1 and 2 were the same, indicating the maximum duration at the chosen rate of consumption. For comparison purposes, and also as an independent check of the formula in Proposition 4, this method was used with depreciation at both 8% and zero. 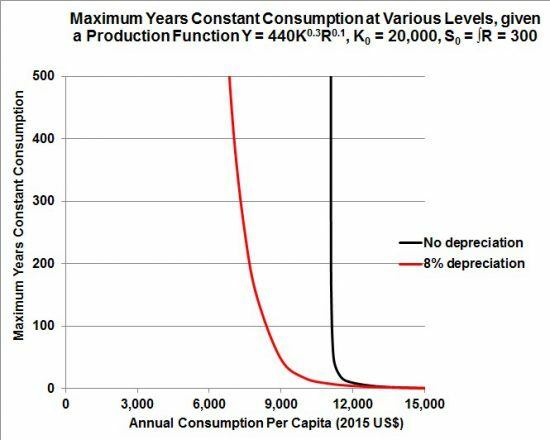 With or without depreciation, maximum years constant consumption are very low for annual per capita consumption above $12,000. With no depreciation, maximum years increase rapidly below $11,500, to about 50 years at $11,200, 150 years at $11,100, and 300 years at $11,090. At $11,080, maximum years were found to exceed 500, consistently with the formula in Proposition 4 which implies infinite maximum years for consumption below $11,086. With 8% depreciation, however, maximum years constant consumption increase more gradually at lower rates of consumption. At $11,000, maximum years are just 8 (rather than infinite when there is no depreciation); at $10,000, 17 years; at $9,000, 47 years; at just over $8,000, 100 years; and at $7,000, about 400 years. On the assumptions made, consumption could be maintained at about its current level ($7,500 per person) for about 250 years. That might not seem such a bad prognosis, except that the assumptions on which it depends are so stringent. In reality, resource extraction costs are not zero, and they tend to increase as the more accessible sources become exhausted and exploitation shifts to more difficult locations. In reality, it is unlikely that, without technical progress, man-made capital can substitute for non-renewable resources to the extent implied by the Cobb-Douglas production function. In reality, population will continue to grow for some time, even if it eventually stabilizes. What’s more, a scenario which provides only for maintaining per capita consumption, with no hope of growth, and no means of raising the living standards of the poor other than redistribution from the better off, would be a gloomy prospect. Leaving aside any wider social and political consequences, it would almost certainly lead to powerful demands to raise consumption in the short term at the price of reducing investment and so reducing consumption in the longer term. The conclusion I draw is that the approach suggested by the Hartwick rule would be unlikely to sustain consumption per person for more than a few years, and would be extremely unlikely to do so for longer (100 years, say). It is important to be clear as to the nature of the inference here. Although I have presented a model, based on assumptions, and drawn out some of its implications, I have not claimed that what happens in the model is likely to happen in reality – an obvious fallacy. Instead, the premise of the inference is that, even under what might be considered the ideal conditions of the model (ideal, that is, for constant consumption without technical progress as resources deplete), maintaining consumption in the long term at its current level would be only just about possible. Since actual circumstances are, in several important respects, likely to be very far from ideal, the above conclusion follows. See for example the title and opening sentence of Hartwick J M (1977) Intergenerational Equity and the Investing of Rents from Exhaustible Resources American Economic Review 67(5) pp 972-4. Solow R M (1974) Intergenerational Equity and Exhaustible Resources The Review of Economic Studies Vol 41 pp 29-45. See p 37 and Appendix B p 43. Hartwick, as 2 above, p 973. A simpler proof by J Pezzey may be found in Perman R, Ma Y, McGilvray J & Common M (3rd edn 2003) Natural Resource and Environmental Economics Pearson Addison Wesley pp 660-2. Buchholz W, Dasgupta S & Mitra T (2005) Intertemporal Equity and Hartwick’s Rule in an Exhaustible Resource Model Scandinavian Journal of Economics 107(3) pp 547-561. See pp 549 & 558. Buchholz et al, as 5 above, p 553 state this formula but (because they start from a Cobb-Douglas production function without my B term), without the term in B. The fact that B is raised to the power 1/(1-β) was derived mathematically by me and confirmed, for my chosen initial and parameter values, by spreadsheet calculations with C in the vicinity of the implied Cmax. Solow, as 3 above, pp 37 & 39, which suggest β ≈05 and α ≈ 3β. ILO / OECD (2015) The Labour Share in G20 Economies https://www.oecd.org/g20/topics/employment-and-social-policy/The-Labour-Share-in-G20-Economies.pdf. See charts p 4. Johansson A, Guillemette Y & 7 Others (2013) Long Term Growth Scenarios Economics Department Working Papers No 1000 http://www.oecd.org/officialdocuments/publicdisplaydocumentpdf/?cote=ECO/WKP(2012)77&docLanguage=En See charts in Fig 11 p 23. Although these charts suggest an average ratio somewhat above 2, they relate to selected countries only. Ratios are probably lower in many poor countries with predominantly agricultural economies. Wikipedia: Oil Reserves https://en.wikipedia.org/wiki/Oil_reserves. . These figures relate to proven reserves, and (as has happened in the past) additional reserves will probably be discovered. On the other hand the effect of carbon emissions on climate will probably limit the extent to which reserves can be exploited. Tilton J E (2006) Chapter 3 Depletion and the Long-Run Availability of Mineral Commodities, in Doggett M D & Parry J R (ed) Wealth Creation in the Minerals Industry: Integrating Science, Business and Education Society of Economic Geologists Special Publication No. 12 http://www.bbk.ac.uk/ems/research/Seminar_info/Wealth%20Creation See Table 1 p 63 listing 11 minerals, of which (at zero production growth) 5 have life expectancy less than oil and 5 more. The distinction between reserves and resource base is explained in Tilton (as 14 above) p 62. Buchholz et al, as 5 above. Modelling of depreciation is introduced on p 551 and the stated result is on p 553 (case θ = 1 and δ > 0). OECD Consumption of Fixed Capital as % of GDP 2013 (latest year available) Total (of OECD countries) 16.5% (http://www.keepeek.com/Digital-Asset-Management/oecd/economics/national-accounts-at-a-glance-2015/consumption-of-fixed-capital_na_glance-2015-table49-en#.WD63Z9WLTIU), assumed similar for non-OECD countries. This entry was posted in Macroeconomic Theory, Minerals and tagged constant consumption, Dasgupta_Heal-Solow-Stiglitz model, Hartwick rule, Hotelling rule, non-renewable resources, resource depletion, technical progress. Bookmark the permalink.